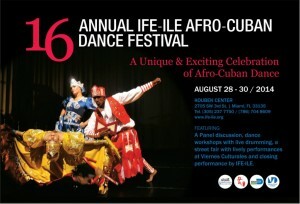 15th Anual IFE-ILE Afro Cuban Dance Festival 2013 will be July 17, 2013 at the Little Haiti Cultural Arts Center and is an event not to miss. The opening event will be a panel discussion on cultural topics at Miami Dade College Wolfson Campus on August 15th at 7:00pm with the participation of local scholars and a closing performance by IFE-ILE drummers. The 15th Annual IFE-ILE Afro-Cuban Dance Festival features dance and drumming workshops in Afro-Modern dance, Orisha dances, Rumba, Congo (Cuban style), traditional Guinean dance by experts on the traditional forms (from 9:00AM to 5:00pm) and a closing performance by IFE-ILE Afro-Cuban Dance Company and guest artists featuring traditional and fusion pieces followed by a party/jam at the theater lobby (8:00pm to 11:30pm)). The opening event will be a panel discussion on cultural topics at Miami Dade College Wolfson Campus on August 15th at 7:00pm with the participation of local scholars and a closing performance by IFE-ILE drummers. VENDORS ARE WELCOME!